Maltese Cross Plants: Do Flowers Conform to Graphic? Do the flowers conform to the graphic? 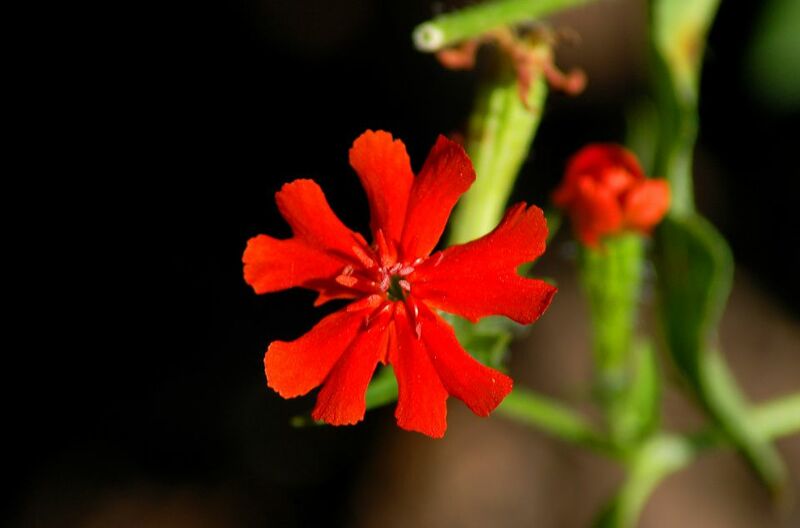 Plant taxonomy classifies Maltese cross as Lychnis chalcedonica. The derivation of the plant's common name is easily seen if you compare the flower structure to Maltese cross graphics (see below). Other common names include "London pride" and "Jerusalem cross." Lychnis chalcedonica plants are herbaceous perennial flowers. This perennial is a member of the Caryophyllaceae family (commonly called the "pink" or "carnation" plant family). Maltese cross plants reach a height of 3-4 feet with a spread of about half of that. Their flower heads most commonly bear clusters of scarlet red blooms, although other colors do exist. Flowers bloom in mid-summer in USDA plant hardiness zone 5, for example. Indigenous to parts of Eurasia, Maltese cross can be grown in zones 3-10. Grow this perennial in full sun and in a well-drained soil. Maltese cross flowers are often grown with yellow flowers to create striking red and yellow plant color schemes. This is also the type of perennial that gardeners interested in tradition tend to collect: A plant with a rich history (see below), Maltese cross is an old-time favorite that has been grown for centuries. Cut back the old stems down to the ground, in late spring. When Maltese cross plants achieve some height, it is best to stake them, because the stems tend to fall down. To promote continued flowering, deadhead the flowers during the summer. This is one perennial certainly not grown for its foliage, which is not considered especially appealing: The leaves tend to look disheveled, plus they brown up easily. And the weak stems require staking. But admirers of Maltese cross overlook these features in order to enjoy the bright red color and unusual shape of the plant's flowers. This is an effective plant for attracting hummingbirds. It is also a good plant to attract butterflies. This plant's flower structure can bear a resemblance to a Maltese cross graphic. But history buffs know that there is a rich history behind the Maltese cross symbol. Legend has it that the Maltese cross plant shares a bit of that history. The Maltese cross symbol belonged to the Knights of Malta (Malta is an island in the middle of the Mediterranean). According to tradition, it was these Knights of Malta who, at the time of the Crusades, brought Lychnis chalcedonica plants to Europe in their journeys home from the Holy Land. If we look again at the specific epithet, chalcedonica, we see where the Knights of Malta are thought to have discovered the plant: Chalcedon. Chalcedon was located in what is now Turkey. It was the site of a famous event in early Church history, the Council of Chalcedon (A.D. 451). Meanwhile, the genus name, Lychnis, tells us that the plant is related to the better-known rose campion (Lychnis coronaria). Lychnis means "lamp" in Greek (presumably referring to the "brilliance" of the flowers). But Does the Flower Really Look Like a Maltese Cross? The Lychnis chalcedonica plants encountered most commonly in North America at present (apparently, this wasn't always the case) bear mainly flowers with five petals. But as any Maltese cross graphic will reveal, the Maltese cross symbol has four parts: namely, four "arrowheads" that intersect at their narrowest points. So if you, yourself own one of these plants sporting the five-petal look, you may start to wonder if the name "Maltese cross" is not perhaps a misnomer. The more you look at one of the five-petaled Maltese cross flowers, the more the discrepancy will bother you. One can speculate that gardeners over the centuries have grown two versions of what we now know as "Maltese cross." Folks used to distinguish between the two. But, as time passed, the two came to be lumped together. One version, which has four petals, was first to claim the name "Maltese cross." The other, with five petals, may once have been called "Scarlet Lightning." So the latter now shares the name "Maltese cross" with the original perennials of that name, even though they are not, technically, cross-shaped (and to confuse matters further, the name "Scarlet Lighting" now doubles as an alternative common name for all Lychnis chalcedonica plants). Perhaps cross-breeding over the years reached a point where it was no longer deemed necessary to draw a distinction between the two. The plant with the four-petaled flowers can best lay claim to the name "Maltese cross," because of the cross shape of its blooms. At least the five-petaled type does also display, at the tips of its petals, the signature indented Vs made famous by Maltese cross graphics. There is still hope of witnessing a perfect Maltese cross even if you grow the five-petaled type. A stray four-petaled flower does crop up occasionally in a red sea of otherwise five-petaled blooms. When that happens, you will be as delighted as if you had just discovered a four-leaf clover.